Welcome to my stop on the Island Batik Great Outdoors blog hop! All through this hop the ambassadors are sharing the newest Island Batik fabric collections (which are hitting stores now!) and there are prizes galore to be given away 😊 You'll want to be sure to check in with everyone to see the amazing things they've been making. I was assigned the beautiful Vintage Morris collection to work with for this hop. 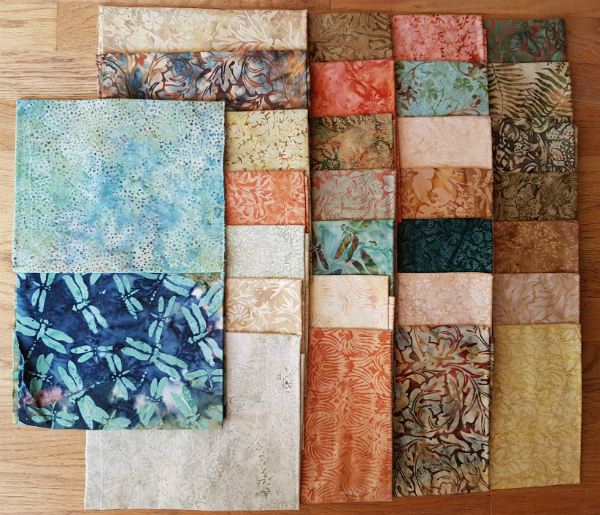 This was the surprise bundle in my first Island Batik box back in February and I just love the nature inspired prints and the range of colours from very light to very dark. I think my favourite print might be this one, called Mini Sprigs, which is included in the collection in 6 different colours. 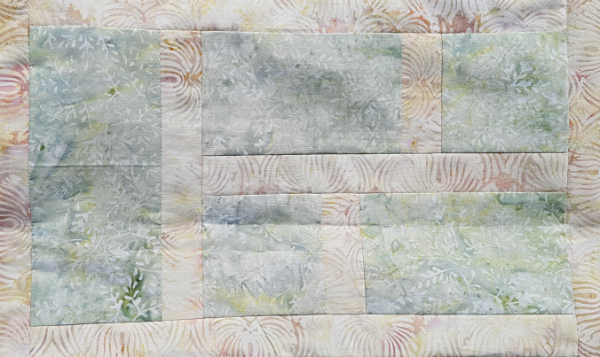 The inspiration for this quilt design came from the print on my shower curtain, of all things. Proof once again that quilt designs really are everywhere! I've been looking at it for years and thinking, "That needs to become a quilt design" and now it finally has. 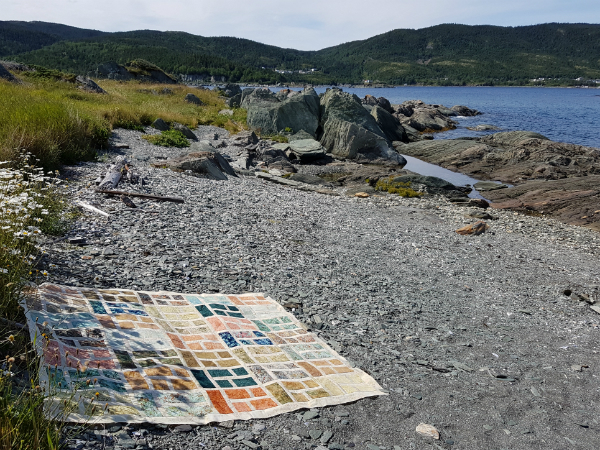 I just love quilt-on-the-beach pictures, don't you? I had yardage of one light fabric and one dark from the bundle, so I chose the light as my background. That meant I couldn't use some of the other lights for the blocks because I was afraid they wouldn't have enough contrast and the block design would be lost. I'm looking forward to using them in upcoming projects now that I don't have to keep them secret anymore. Two of the fabrics I did use almost blend in with the background. You can see what I mean in the pictures above, but here are close ups of them. My blocks are actually straight, I swear, but they sure don't look it when draped over a rock for pictures! These ones certainly didn't blend in! I love this deep green tone on tone. In certain lights, the copper toned background of this print seems to glow around the green. This light teal is so pretty, too. And I love the dragonflies! 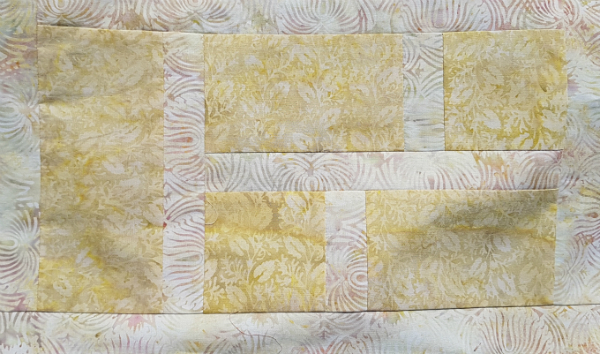 Unfortunately, I didn't have time to get this one quilted in time for the hop, but I do know what design I want to use, so I'm a step in the right direction already. I plan on releasing the pattern, just as soon as I can get it written and tested. If you're interested in testing it for me, please let me know in the comments. 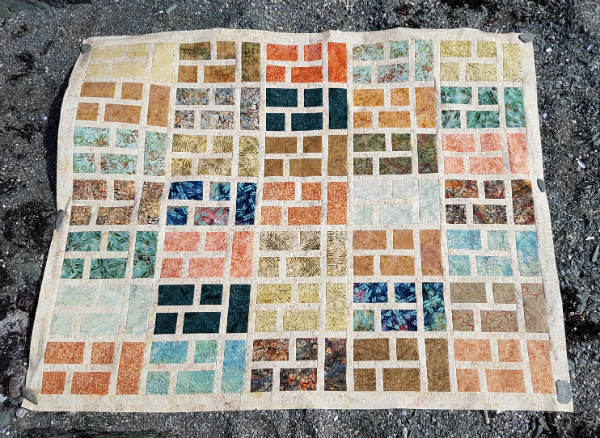 Formal Garden finishes at 59" x 73," is super quick to piece and it would be a great stash busting quilt. I said there are giveaways during the blog hop, didn't I? Well there are - and lots of them! Island Batik is giving away fabric strip packs on their blog (where you can also find the full schedule of participants) and each ambassador is also hosting a giveaway on their blog. For my giveaway, the winner will be able to choose 2 of my PDF patterns 😊 To enter to win, just leave me a comment telling me your favourite summer activity. For more entries, follow me on IG (@devotedquilter) or FB (@devotedquilterdesigns) and leave a comment for each way you follow me. And for one more entry, subscribe to my monthly newsletter, The Bulletin. If you do, I'll show up in your inbox on the 16th of each month with news from here on the blog, a family favourite recipe and a fun themed roundup of things to make. You'll also receive my free Wind Farm quilt pattern, which is only available to subscribers. If you subscribe, just leave another comment saying you did (or already do!). The giveaway will remain open until after the end of the blog hop. I'll pick the winner the morning of September 8th and they will be notified by email (so make sure to leave me your email address if you are a no-reply blogger). Edited September 8th - the winner is comment #28, Sharon Aurora 😊 Thanks, everyone, for entering! Here's one last picture. I think this might be my favourite of all. I love this beach. And here's the full schedule of participants 😊 Happy blog hopping! I'll try to keep up with updating this list with direct links to the blog hop posts as they're published. Beautiful quilt top, Leanne! The pattern really shows off the fabrics in this collection, you must have a great shower curtain! Beautiful quilt. I would love to test your pattern for you. My favorite summer activity is gardening. A great design for showcasing the beautiful palette in that collection. I love all the colours! your quilt is lovely. i really like that it came from your shower curtain. my favorite summer activity is going on picnics and spending outdoor time with my family. 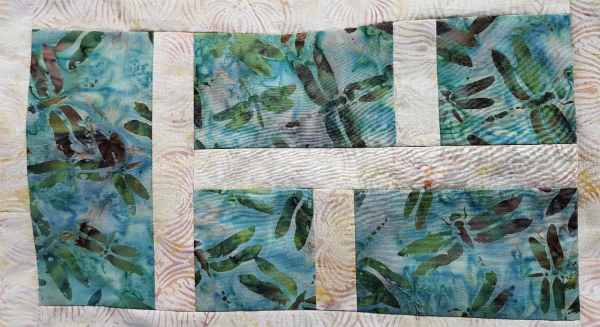 This quilt perfectly reflects a formal garden. Well Done! 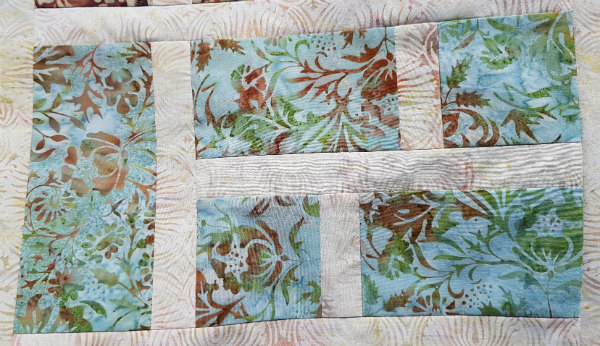 Formal Garden is a perfect name; it's a beautiful design and quilt, Leanne! 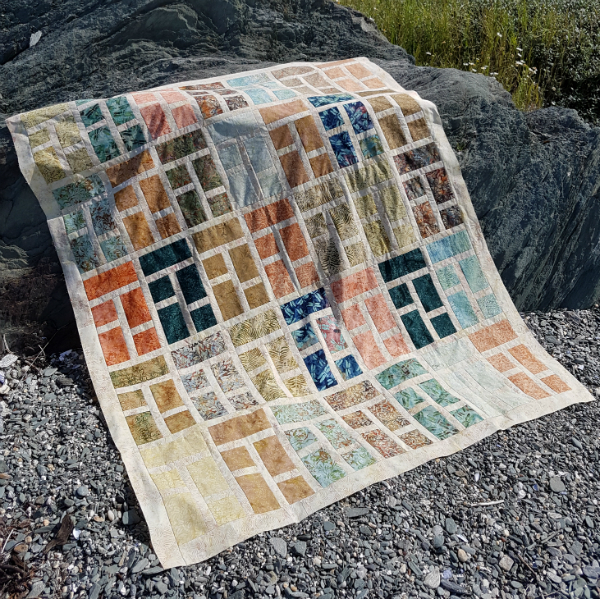 Lovely quilt and the pics are great, I love quilts on the beach too! My favorite summer activity is beach walking. Love your quilt. Great use of the fabric. Lovely quilt, and perfect for the colors and fabric. Great photos, too. I just love sitting by the lake, or canoeing. Picnics, too. What a pretty quilt! 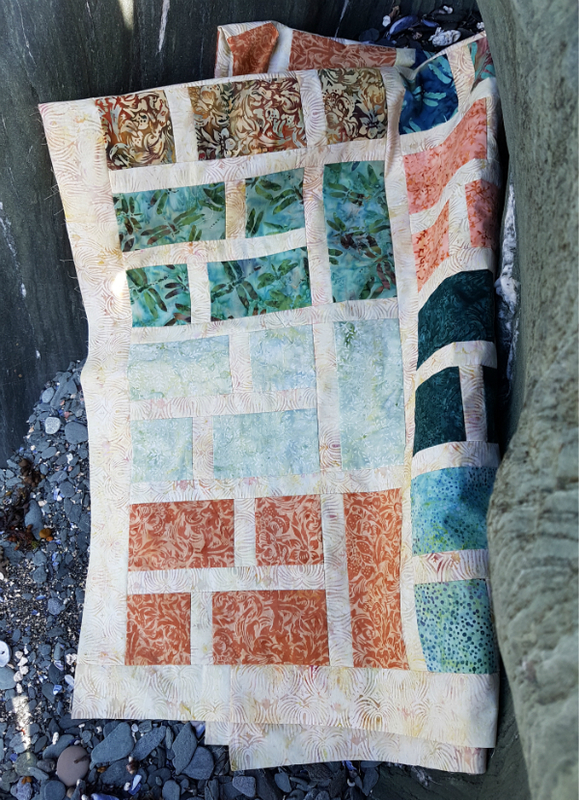 It's true that ideas are all around us - great job of making your inspiration into this lovely quilt! 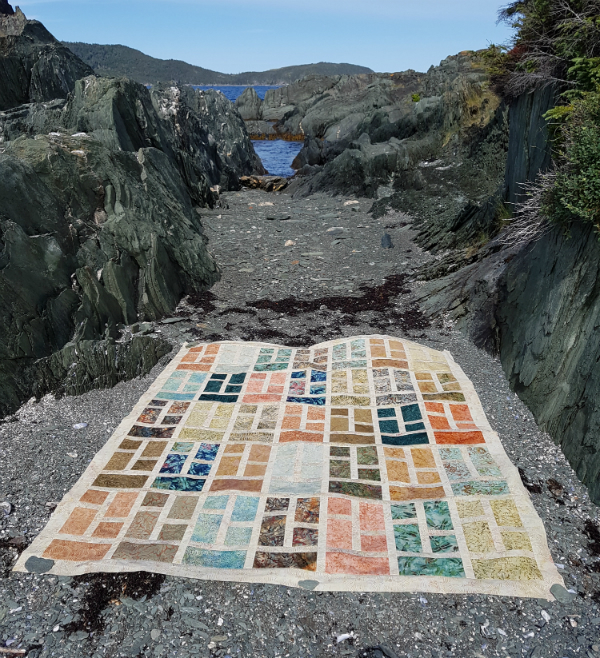 Quilt-on-the-beach pictures are just fantastic. Great way to showcase all those beautiful fabrics. 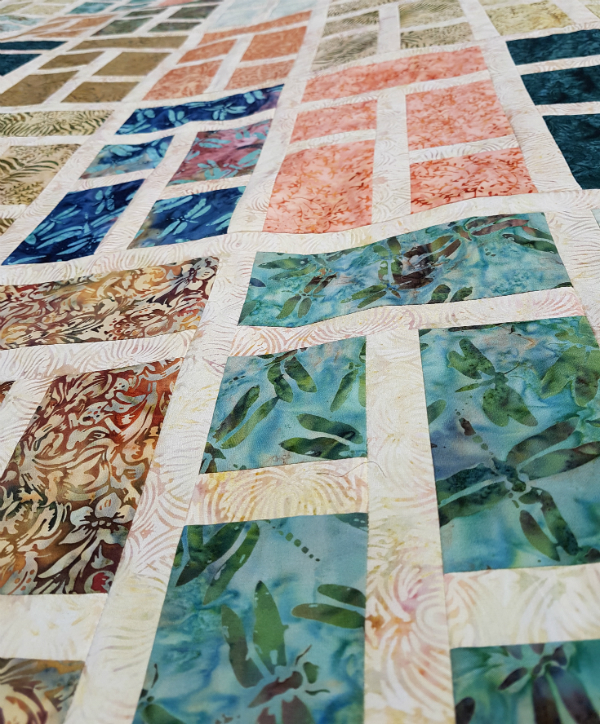 Great quilt to show off those beautiful fabrics! Summer for me is all about enjoying nature with my family. 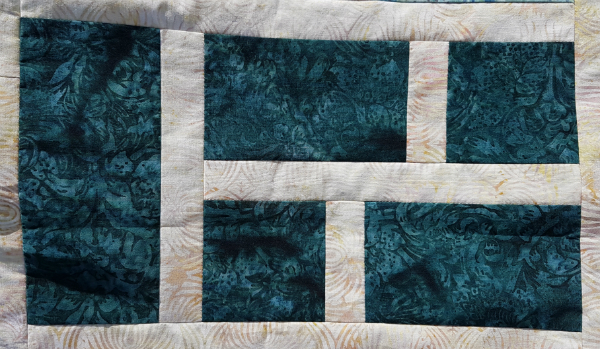 Sometimes simple squares and rectangles make just the most striking quilts. I love this one and the colors are so beautiful! I have never been a pattern tester, but you could send me some information about what would be involved. I would love to try this pattern. Swimming...everyday!!! Thanks for sharing your talents with us today. I signed up for your monthly bulletin. I forgot to say above what my favorite summer activity is... I like gardening hiking. Beautiful way to show off the gorgeous fabrics! Summer for me is all about spending time outside with my family. Following on FB & will receive your newsletter. What a delightful pattern! The fabric collection is yummy too. I love your location shots. I'm following you on IG (@sma_fb). I'm following you on Facebook. I've subscribed to your newsletter. I like the layout of your quilt. It shows off all the fabrics very well. Love these fabrics in your pattern. Thanks for sharing. I started following on IG. This is a VERY pretty quilt. I would love to test drive your pattern for it! An one of my very favourite summer activities is sitting on my front porch, iced tea in hand, watching the world ant the neighbours go by. My favorite summer activity is sewing with my granddaughter, when she comes to spend some time during school vacation. Your quilt is wonderful. I'd be interested in testing your pattern. My favourite summer activity is camping and all the travelling that sometimes accompanies it. I am never without a hand quilting or knitting project when I am camping. Usually it is EPP or a pair or two of socks. I signed up for the Bulletin. I am so glad you are going to be publishing your hop pattern. I will be patiently awaiting its release. What a beautiful quilt! Looks gorgeous, especially with the wonderful backdrop. My favorite summer activity is hanging out at the pool with my grandson. My favorite summer activity is being out and enjoying nature whether sitting by and enjoying a body of water, gardening or going for a walk. My favorite thing about summer is being outside, gardening, and just enjoying nature. I have signed up for your newsletter. Looking forward to following along. Summer is when I get to see my Grandkids. Best activity I can think of! My favorite summer activity is going to the Iowa State Fair.... I love the fair, concerts, food, people, etc. Your quilt is beautiful. I follow you on IG... @cshelleyqbq. My favourite summer activities are horseback riding and camp fires. Or anything outside really. I love your quilt. Isn’t it interesting where we find inspiration! And Subscribing to The Bulletin newsletter, thank you! My favorite activity in the summer is spending time with my grandchildren. They love to come to Nana's to swim and play. I would enjoy testing out your pattern, especially since you said it works up pretty quickly. I subscribed to your newsletter. I look forward to seeing it. Love, your quilt! It reminds me of old cobblestone streets - but with much more beautiful color!! Thanks for the opportunity to win. I followed you on IG, FB, and subscribed to your newsletter! 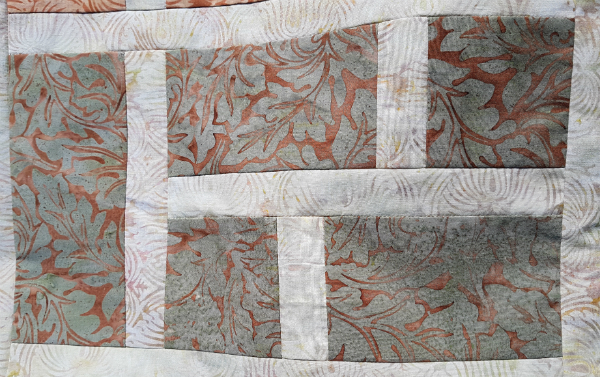 I also love the settings in which you photographed the quilt - beautiful! I actually think "Shower Curtain Quilt" is a hilarious name and that would make me want to make it! Fun quilt and the pattern shows off these fabrics beautifully. I love to pick flowers from my garden to brighten my home. I've subscribed to your Bulletin. Beautiful job on your challenge quilt! I am a new follower on Instagram, where I am "@wordygirl11". I just subscribed to your newsletter, using my wordygirl at earthlink dot net email address. I love your quilt and agree that ideas are always around me. I'm always looking at walls, floors and TV commercials and thinking "great quilt idea", but have yet to do one. I love the fabrics you chose and think having those lighter blocks offers a good balance. Thank you for the opportunity. I love that quilt. It would have been fun to see the shower curtain inspiration! Maybe it's the first impression factor, but I really love that orange sprig fabric you showed first. What a great way to show off all the wonderful fabrics!!! I love your pattern and the colors go so well with it. My favorite thing to do in the summer is puttering in my garden. My favorite summer activity is quilting of course. There's always more time for it during the season. I do also like to garden, but I tend to loose interest once it get too hot and my plants suffer. In Florida my summertime favorite summer activity was the beach, but here in Kentucky no beach so gardening is my favorite now! Something you couldn't do in Florida in the summertime!!! and signed up for your newsletter! I love batiks. I'd probably sew with them constantly if I thought I could get away with it. My favorite summer activity is trying the awesome flavors at the local Popsicle shop. walking on the beach... definitively my favourite summer activity. 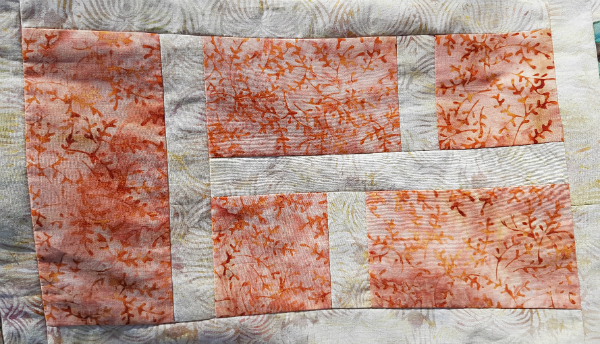 This is a quilt that lends itself to scrappy, and scrappy is definitely what I love to do. I would like to win the patterns, too. I already picked out my two favorites, a hard choice! Thanks for the chance. My favourite summer activity is going to the beach for long swims! Lovely quilt, love the design! I love swimming in summer. My favorite summer activity is gardening. My favorite summer activity is picnics and reunions! I am signing up for your blog. It’s too hot in Texas to do much outside so I use that as my excuse to stay inside and sew! I’ve signed up for your newsletter!